Consumer reviews for any kind of good and service became very popular on the Internet forums mimicking the role played by the expert reviewers. Online forums have reduced the cost of information searching, which increases the number of consumers who use them, both to grab information and to spread it by means of user reviews. Thus, since nowadays consumers (or users) have access to the same channel of communication used by expert reviewers, it is fair to consider whether their opinion may matter for potential consumer choices. In addition, as Internet access is widening and developing this channel of communication and influence among consumers, it may strengthen their relative importance with regard to expert reviewers. As film is a typical experience good, i.e. somebody knows its quality only after consumption, the reviews work as prior information about its quality and reduce the consumer asymmetry of information. Thus, we explore the effects of consumer reviews, as the word-of-mouth (WOM) effect that operates through peer effects, on the length of the run of a film at U.S. movie theaters as much as expert reviews of films released between 2004 and 2015. Using a very rich weekly dataset for the period from the Box Office Mojo and Rotten Tomatoes websites (including consumer and expert reviews), we estimate survival models to evaluate the influence of reviews on the number of weeks a movie is screened. The main contribution of the paper is to perform an “affective analysis” for consumer reviews, where we employ both a “sentimental analysis” (connected to sentimental valence, good or bad evaluation) and an “emotional analysis” (connected to feelings like anger, joy, fear, disgust and sadness). Thus, we mine the online consumer/user review texts, using IBM Watson tools of the Nature Language Understanding set. This allows us to create variables able to represent the feelings a person spreads to his peers in addition to the traditional consumer rating/score available on the sites. 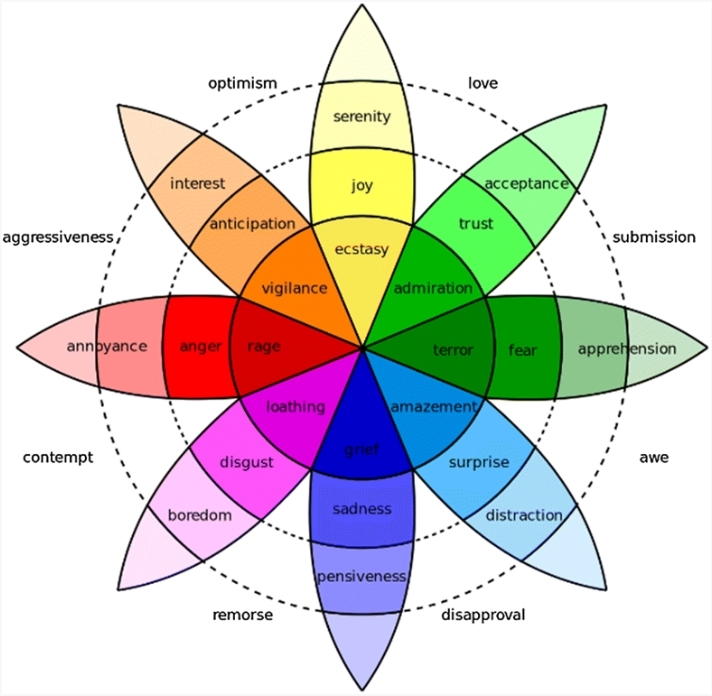 Figure: Wheel of feelings. Source: Plutchik (2001). To avoid the endogeneity problem (simultaneous effects) in measuring the influence of expert and consumer reviews on screening length, where it is difficult to find out whether the review or the film quality is responsible for film demand, we control our estimates for film quality by including both sources of reviews simultaneously. Since both experts and consumer critical reviews potentially suffer from the duality between “influence” and “prediction” and both are quality information about films, including them jointly works as a mutual control for film’s non-observable quality. In addition, we include all observable variables available that bring quality information, like stars, distribution companies, and others. We also control for the bias of quality information provided by experts using the average of all expert reviews made available before and during the first weekend. Regarding the consumer reviews, we use these reviews after the week of release to investigate their effect on screening time at theaters. We find evidence of consumer rating matter in keeping a film running longer at the theaters, but experts’ ratings have a larger influence on the movie market as a whole. Splitting the films by genre, however, we get a null influence of expert reviews on the length of run of widely opening film releases (including blockbusters) and a significant consumer reviews effect. In this case, the peer’s effect is the relevant incentive to film consumption. On the other hand, expert’s influence on narrowly released films is large. Finally, film running times of genres like foreign, drama and action films are greatly influenced by sentiments and emotions spread by consumers through their reviews. Our results are consistent with the hypothesis that a critic review is also an experience good, where tradition and reputation matters in influencing consumption as a trustworthy signal of quality. As reputed top experts have a very reliable signal of quality, their signals of quality matter more than the consumers’ signals. We believe, however, that some consumers are also increasing reliability in their quality signals and getting naturally status of an expert reviewer. Thais Luiza Donega e Souza is Assistant Professor Information Systems at the Federal Institute of Paraná. Marislei Nishijima is Associate Professor of Economics at the University of São Paulo.